Put a "CAUTION: FLAMMABLE" sign in the workshop. Be sure to work in a well ventilated area and furnish workshop with a CO2 fire extinguisher. Do not smoke while servicing fuel system. Keep open flames and sparks away from the work area. Apply new engine oil before installing the parts, as shown above. Do not remove or disassemble parts unless instructed as shown. Remove front exhaust tube and ring gasket. Refer to EX-5, "Exploded View". Disengage red locking clip on quick connector. Disconnect the fuel hose quick connector (1) at the fuel tube side (A). Do not pull with lateral force applied. O-ring inside quick connector may be damaged. Prepare container and cloth beforehand as fuel will leak out. Keep parts away from heat source. Especially, be careful when welding is performed around them. Do not expose parts to battery electrolyte or other acids. Do not bend or twist connection between quick connector and fuel feed tube during installation/ removal. To keep the connecting portion clean and to avoid damage and foreign materials, cover them completely with plastic bags or something similar. Disconnect sub-harness for injectors at engine front side, and remove it from bracket. Disconnect the fuel injector harness connectors. 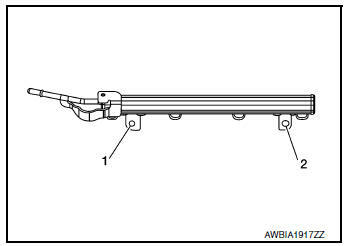 Loosen the bolts in the reverse order shown, then remove fuel tube and fuel injectors as an assembly. Remove the fuel injectors from the fuel tube, (if necessary). Pull fuel injector straight out of the fuel tube. Be careful not to damage the nozzle. Avoid any impact, such as dropping the fuel injector. Do not disassemble or adjust the fuel injector. Install new O-rings on the fuel injector. Upper and lower O-rings are different. Be careful not to confuse them. Handle O-rings with bare hands only. Do not wear gloves. Lubricate O-rings with new engine oil. Do not clean O-rings with solvent. Make sure that O-ring and its mating part are free of foreign material. Be careful not to scratch O-rings during installation. Do not twist or stretch the O-ring. If the O-ring was stretched while it is attached, do not insert it into the fuel tube immediately. Insert the new clip (3) into the clip groove (F) on fuel injector (5). 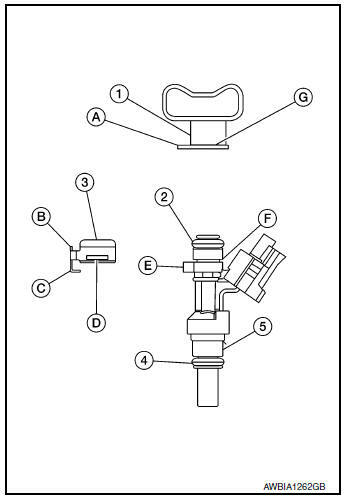 Insert the clip (3) so that protrusion (E) of fuel injector (5) matches cutout (C) of the clip (3). Do not reuse clip (3), replace it with a new one. Be careful to keep clip from interfering with O-ring. If interference occurs, replace O-ring. Insert fuel injector (5) into fuel tube (1) with clip (3) attached. 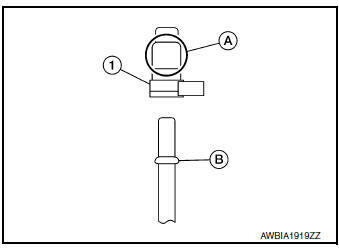 Insert fuel injector (5) so that protrusion (A) of fuel tube (1) matches cut-out (B) of the clip (3). Check that fuel tube flange (G) is securely fixed in flange groove (D) on the clip (3). 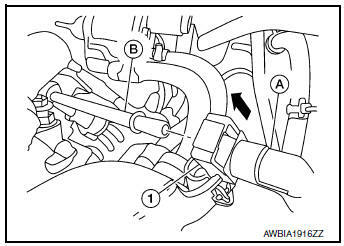 Check that installation is complete by checking that fuel injector (5) does not rotate or come off. Install fuel tube and fuel injector assembly with the following procedure. Insert the tip of each fuel injector into intake manifold. Tighten the bolts to specification in the numerical order as shown. CAUTION: After properly connecting fuel tube assembly to injector and fuel hose, check connection for fuel leaks. Connect the fuel hose quick connector. Make sure no foreign substances are deposited in and around the fuel tube and quick connector, and there is no damage to them. Thinly apply new engine oil around the fuel tube tip end. Align center to insert quick connector straight onto fuel tube. Insert fuel tube into quick connector (1) until the spool (B) on fuel tube is inserted completely. Engage red locking clip on quick connector. Hold at position (A) as shown, when inserting the fuel tube into the quick connector (1). Carefully align to center to avoid inclined insertion to prevent damage to the O-ring inside the quick connector (1). Insert the fuel tube until you hear a “click” sound and actually feel the engagement. To avoid misidentification of engagement with a similar sound. Ensure that red locking clip is firmly secured. Perform procedures for “Throttle Valve Closed Position Learning” after finishing repairs. Refer to EC- 140, "Work Procedure". If electric throttle control actuator is replaced, perform procedures for “Idle Air Volume Learning” after finishing repairs. Refer to EC-141, "Work Procedure".